One of the challenges of hiking in the high Canadian Rockies with family and friends, is that everyone has different desires and abilities, and often there is a long trudge up through the forest to get to the alpine areas. Well, this trip solves all that - with a helicopter on hand to whisk you to the best spots, and expert guides to help everyone enjoy the hike that suits them best. You’ll experience the Canadian Rockies as few ever will – flying over glaciers, strolling through alpine meadows bursting with wildflowers, standing in awe of the vast Canadian wilderness – even jumping in an alpine lake for a quick dip after a picnic lunch! And when you’re done, the helicopter whips you back to your wonderful cozy lodge for a slap-up dinner and an evening sharing stories of your day. This journey is all about choice. Before you start the heli-hiking part we offer a choice of daily activities, such as wildlife viewing and horseback riding. And once you are in your fly-in lodge, each day you will be asked how much – or how little – you feel like doing. And doing nothing and reading a book next to the fire is just fine too! Definitely no tents here! When your hike is finished return to your cozy lodge to share stories with your new friends, relax in the hot tub and enjoy amazing food and wine. Life does not get much better than this! Arrive in Calgary before traveling to Banff – a unique destination as a UNESCO World Heritage Site with all the charm of a small mountain community. Breathe in the fresh Canadian Rockies air – you’ve arrived! Enjoy the views on a motorcoach transfer from the Calgary Airport to Banff National Park. Fill your lungs with cool, fresh Rockies air and head out for a day of exploration. Today your activity options are all about exploring some of the most beautiful places in Banff National Park either with a group or at your own pace. Peruse the selection at Primrose Dining Room's buffet breakfast – complete with an omelet station. If the buffet isn't open, dig in to a delicious dish from their A La Carte breakfast menu. Start off your day alongside magnificent views that accompany every table. On a guided sightseeing tour, stroll the shoreline at Lake Louise, and snap photos of the Valley Of The Ten Peaks at Moraine Lake. This one-hour ride brings you through the untouched wilderness just outside Banff town-site. Ride past Bow Falls, Fairmont Banff Springs Golf Course, up Sulphur Mountain, and even crossing the Spray River. On hotter days, your horse may even splash through the water. Discover one of the classic hikes of the Banff area with a group and guide as you hike along a switchback trail dotted with lakes. Your professional driver and interpretive guide will pick you up and bring you a packed lunch for this moderate-difficulty hike. Continue to adventure through the Canadian Rockies today with your choice of activity. Explore Kananaskis and Spray valleys with an expert naturalist. These are outstandingly beautiful areas of jagged peaks, alpine meadows, lakes and glaciers – home to moose, grizzly bears and many other species. Wake up early to experience the stunning scenery of Banff National Park at sunrise. Explore with a private guide and learn how to take great photos. The excitement begins bright and early with a transfer to the heli-pad with a box lunch to enjoy on the way. 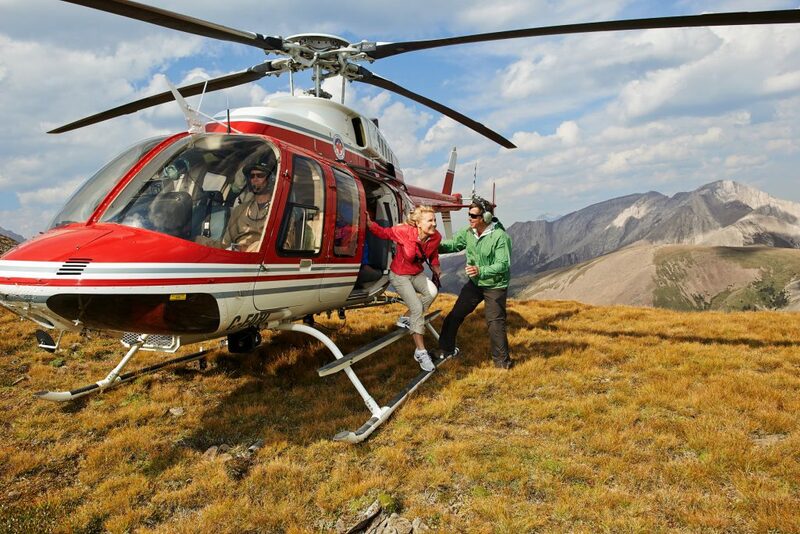 Fly to a remote lodge, accessible only by helicopter. Meet your guide, then soar to a spectacular mountain ridge for an afternoon hike. A typical night includes relaxing in the whirlpool, or sharing stories with new friends by the fire. Consider traveling up the Icefields Parkway to stay at the Cariboo Mountain Lodge just 1.5 hours west of Jasper. The remote lodge and terrain is only accessible by helicopter. The Bugaboo Lodge sits at 1500 m (5000 ft). Featuring 32 rooms with private baths, as well as a sauna, steam room, game room, and cozy bar/lounge area. Enjoy private relaxation or gathering with new friends. The rooftop hot tub boasts unparalleled views of this magnificent setting. Discover alpine terrain most people will never visit, as you head out for more adventures today. Take yourself higher than you ever thought you'd go. Hiking takes place between 1,828m (6,000ft) and 2,438m (8,000ft) – a comfortable altitude for most people. Heli-hikes can accommodate all abilities, regardless of age. Another day of adventure awaits. Your comfortable mountain lodge provides an ideal location to explore the region. Explore the terrain of the Columbia Mountains. Enjoy different hiking locations in the morning and afternoon. Mountain vistas, alpine lakes, wildflowers, and glaciers will leave you in awe. Seated family-style for gourmet meals, mingle with fellow guests and guides while reliving the days adventures. Your trip of a lifetime comes to an end today. Sit back and think of all that you've accomplished as you travel onwards. Say goodbye to the Rockies as you return by helicopter to the landing pad, where a bus transfer meets you to take you to the Calgary Airport for your onward flight. Activities at the Heli-Lodge may vary. Your guides will adjust as necessary to provide the best experience based on weather. The day order of activities in Banff may be adjusted to fit tour schedules. Your Vacation Advisor can give further details. Banff: Lake Louise and Moraine Lake sightseeing tour – Moraine Lake is closed and not included in this tour each year from early October to late May due to avalanche risk. Alternative stops and locations included when Moraine Lake is closed. Guided Wilderness and Nature Tour: Tour only operates Sunday, Tuesday, Friday from June 1 to October 15 as walking trails are not open in early or late season due to not having optimal trail conditions. This trip is available for departures between June and August.